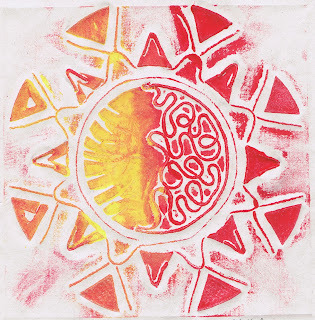 Collagraph (also sometimes spelled collograph) is an entirely different method of making a relief print without carving. Like all relief prints, the raised areas of the printing block will be inked and produce the design when pressed onto paper. 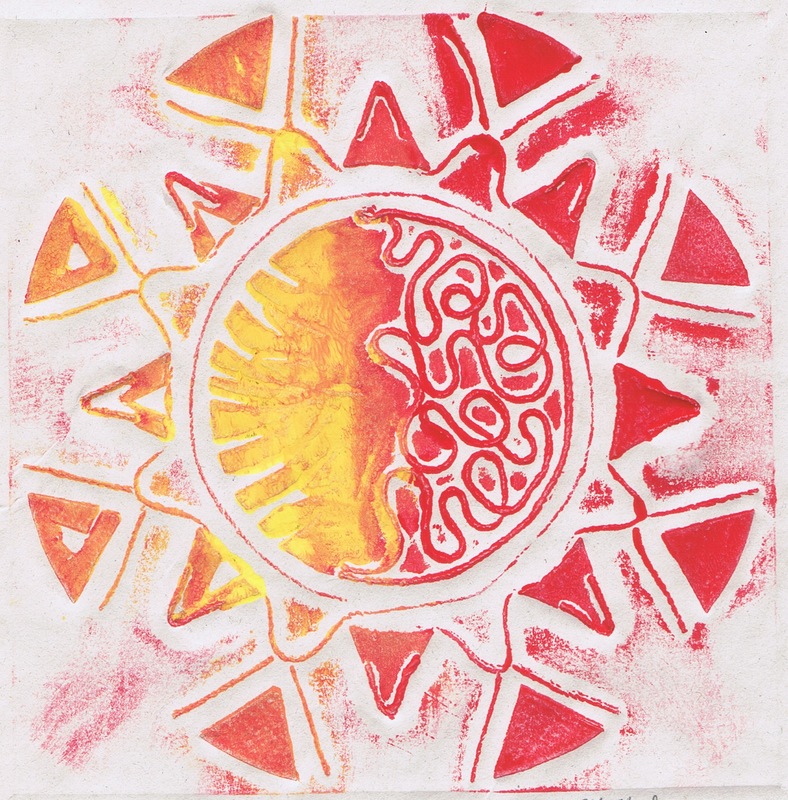 However, for a collagraph the block is made with an additive process instead of the subtractive carving process of linoleum, wood, and rubber block prints. 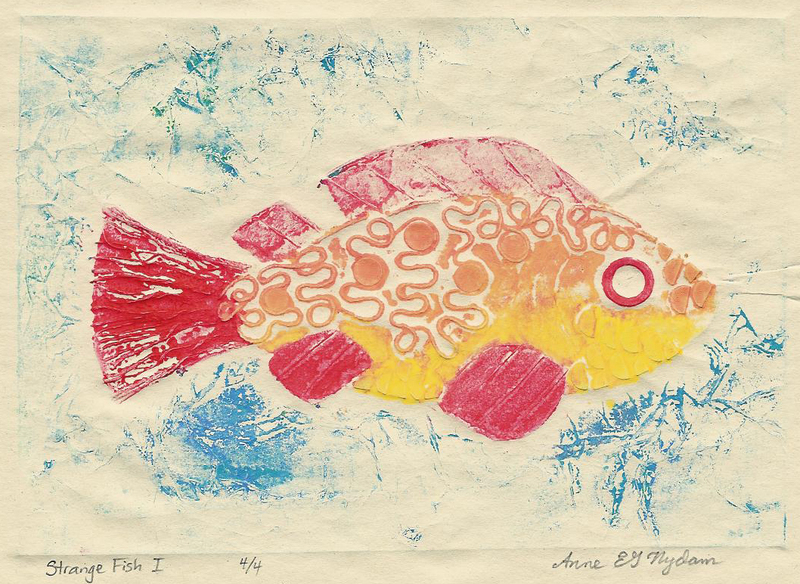 In essence, a collagraph is a collage that's inked and printed. With my fish block, I only managed to get four pulls before my block started to lose its integrity. The pieces of dried leaf and the thin bits of string were the first to start coming unglued, and that was the end of that block. Using more waterproof materials and a more waterproof glue would no doubt have made it more durable, but on the whole I tend to enjoy the experimental feel of the technique, almost more like monoprinting than block printing. because ink will catch a lower area if there's nothing too high nearby, but don't go building your designs with six and seven different layers or they won't all end up printing. A very easy technique that works well for young children is to draw a design on a piece of cardboard, then simply run a nice thick trail of white glue over all the lines. But however simple or complicated your collage, be sure that your glue has a chance to dry thoroughly before you try inking. Impatience here could ruin everything! As for the inking, you can try rolling with a brayer, but that will deposit ink only on the very highest layers, as shown in this very faint frog. To get more color I actually pounced the ink on. It might work to use a stencil brush or something like that. But the idea is to get the ink pretty much everywhere, because it will still transfer onto the paper only from the higher areas. Compare with the more detailed frog. So that's my latest experiment in collagraphy. (For me, all collagraphs are always experimental.) Nothing too outrageous in the materials. The main body of the frog is mat board, cut and arranged for differences in height between the different areas of leg, body, etc. The most interesting materials are a milkweed seed for the nostril and dried hydrangea blossoms. They're so delicate I was afraid they wouldn't show up, but their texture is so beautiful I had to try. I think he's pretty charming. I think he's fabulously charming. HI, I ran across your blog while looking for examples to show my Art I students what a collagraph print could look like. Most of my students have trouble thinking of ideas without an example. Your explanation of how the process works is great! In my own work I find that I need to seal the plate before printing. I am going to try using a latex primer house paint with the students. I will require that they make at least 2 prints from their plates. Thanks for your help. Thanks for the tip about sealing with latex paint. That seems like a smart idea. Thanks for sharing your work. It's a beautiful little print. I'm using this page to demonstrate to Secondary Students how to create collagraphs. Your explanation was really clear and helpful! Bless you! Note added later - I tried having some students seal their collagraphs with acrylic paint, and it didn't work well at all. The paint started peeling off the block onto the inked brayer. I'm trying to think of other techniques to experiment with.